A personalized healthcare plan using and in-depth constitutional assessment. Authentic herbal medicine and practical dietary and lifestyle recommendations. 75 minute in person or phone. Delight the senses with four-handed Ayurvedic warm herbal oil massage and Shirodhara, to make the mind tranquil and calm. Herbal steam bath and body scrub included. A wide selection of traditional Ayurvedic therapies as well as Therapeutic Massage and Bodywork. Traditional Panchakarma personalized cleansing retreat to remove deep-seated toxins and then to rejuvenate. Personally supervised by Ayurvedic Doctor, Vishnu Dass. 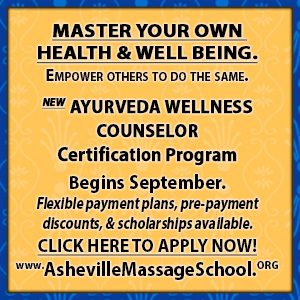 Ayurveda Asheville NC – Allow Ayurveda to restore harmony and balance in your life, and empower you to take control of your health with a natural, common sense approach. At Blue Lotus Ayurveda, we offer personalized and holistic family healthcare that focuses on the whole you. Our services include Ayurvedic health consultations (in-person & long distance), individualized herbal treatments, nutritional and lifestyle counseling, Panchakarma (deep detox and rejuvenations), traditional Ayurvedic therapies, therapeutic massage, weight management programs and more for Ayurveda in Asheville NC. Experience our Ayurvedic Day Spa packages to promote deep relaxation and healing or therapeutic massage with some of the best massage therapists in Asheville. All text and images are © Vishnu Dass. All rights reserved. No images or text can be used or copied, in whole or in part, without written permission from the author.